This is a new pattern I’ve been designing. I worked on it through Conference weekend, and it is turning out just beautifully. I’m including the pattern below. The motif is a flicker of light with twelve repetitions radiating around. 12 hours in each turn of the clock, 12 months in a year. This lace is being made in Turkish thread size 60 which roughly translates to size 30 in the United States. I’m using a size 21 Tulip brand hook (equal to size 14 Boye hook). Other thread sizes and hook sizes may be used as appropriate. Row 7: Ch 8, p in 3rd ch from hook, counts as first dtr, dtr, p, tr, p, in the ch2 sp of previous row. ch2, 2sc in ch5 sp of previous row, *ch2, tr, p, dtr, p, dtr, p, dtr, p, tr, p, in next ch2 sp, ch2, 2sc in next ch5 sp* repeat around, tr, dtr in first space, join with sl st to the top of the first dtr made. Row 8: sl st through p of previous row, ch 6, dtr in 2nd sc of previous row, ch 6, 2sc in top of middle p of next group, repeat around. Sl to join. Row 9: Sl st in next ch, ch 4, counts as first dc and ch1. *Dc, ch1, four times in each ch6 loop around. Join with sl in the 3rd ch of beginning stitch to join. A few months ago, I was asked to make an altar cloth that was very dense, for a specific altar. This is what I came up with. It’s called “Snowflurry”, and it’s made lengthwise rather than in squares. I like it. It’s simple, and elegant, but one of the things I discovered after making this lace was that even though it was dense and beautiful, it tended to stretch more in one direction than in the other, making it difficult to keep blocked. In order to help it keep its shape, I modified it, added extra stitching in a double row around just before the border. The stay stitching helps! However, I’ve learned an important lesson, block patterns are better than one piece patterns for altar lace. Mary Jo Stegeby is a good friend of mine, and my very first lace student. Her first altar cloth was a pattern I love, called Pondlily. This is her second. She started this altar cloth about a year ago, and it’s now complete. This is a pattern she designed and modified from a visual image on pinterest. It’s size 30 thread. It’s being given to the Monterey, Mexico Temple. So beautiful. 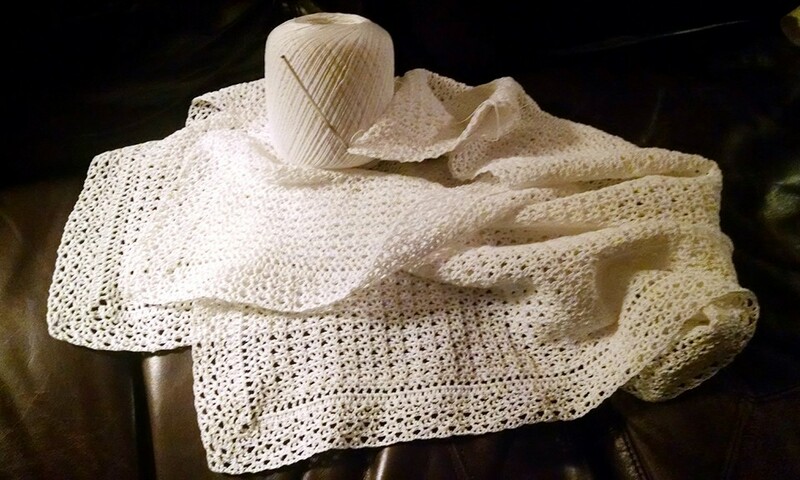 A little more than a year ago, a group of ladies in my area started taking crochet lessons from me, with the goal that they eventually wanted to make an altar cloth. Most of these women had never crocheted before, or had just a few basics down, but not enough to follow a pattern. We started with yarn. There are four basic stitches in crochet. “If you learn these four stitches, you can make almost anything!” I told them. There are of course, fancier stitches, but most everything you make is a combination of chain, single crochet, double crochet or triple crochet. There’s also a slip, that hardly counts as a stitch at all. That’s it. Four stitches. We made a lot of granny squares, and put them together in afghans. Some of the ladies got a little more creative with their granny squares, but the basic idea was the same. Squares. A basic granny square requires a chain stitch and a double crochet. That’s it. Not too hard. After our granny square afghans were completed, we started a new project with one size smaller yarn, and a modified granny square. We discovered a need for NICU baby blankets to help preemie babies at the hospital. This time, armed with baby yarn, we were making baby blanket granny squares. Almost the same pattern, just a little smaller. The lace thread was a larger jump than going from yarn to baby yarn had been, but with a little practice, many of us are getting it. We decided to start an altar cloth. It’s a work in progress! So far, seven sisters are participating in the making of this lace. We’re calling it the “Sister’s Lace”. Each square is only six rows, not very much different than a granny square. This is great practice for an altar cloth. If you are looking for a pattern that is simple and elegant, this is a good one to try. The secret is, if you can make granny squares, and have the will to practice, you can make lace. “I have always had a talent for needlework, crochet and knitting at a very young age. I always wanted to learn to tat and my grandmother knew how. The problem was that she lived in Idaho and I lived in New Mexico and our visits were never long enough for her to teach me. I tried teaching myself from several different sources but it wasn’t until I got a copy of Reader’s Digest Complete Guide to Needlework that I figured out how to tat with a shuttle. I added it to my list of abilities and moved on to other things. Barbara already has another two needle tatted altar cloths in progress. Her goal is to make an altar cloth in honor of each of her 9 children. I am not as familiar with needle tatting as I am with shuttle tatting and crochet, but this turned out to be just beautiful. This is an altar cloth made by Marla. It was featured about a year ago, and has been completed. It’s beautiful! 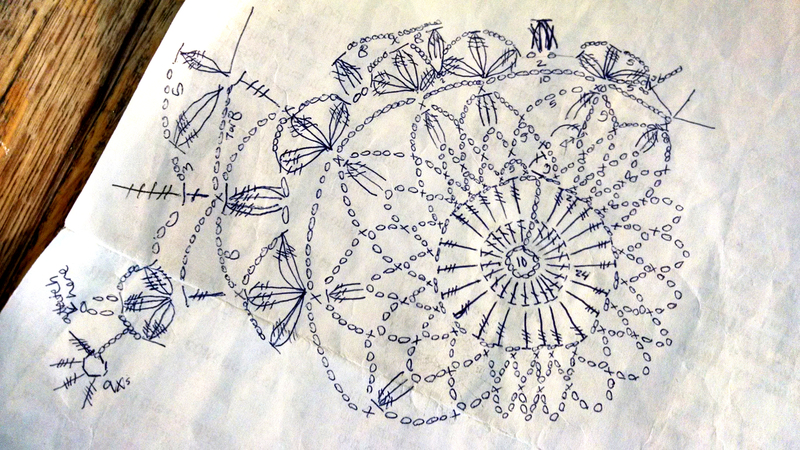 Marla originally saw a piece of lace that had no pattern and recreated the pattern from scratch. “I have to tell you this little story…. a couple of weeks ago when the big final push was on to finish, I took the cloth with me to my Aunt (my Mother’s dear youngest sister) Colleen’s cabin in Island Park for a family reunion. My mother passed away 2 years ago last July and because of that my Aunt decided to start getting all the cousins together every August at the cabin where we all spent our childhood. I thought I could get a lot of work done while sitting and visiting in the evenings… and I did, but while working on the cloth my sister-in-law asked what made me want to make one…. I explained that I really didn’t know & I had never thought about it before, but that a few months after Mom passed I came across your site and was prompted….Strongly…. and this nagging feeling just wouldn’t go away! I just had to do it. Rnd 1: Foundation ring….Chain 9, slp.st. (slip stitch) in beginning stitch. Chain 3 (counts as 1st triple), 23 triple (triple crochet) in beginning ring. Slp.st. in 3rd stitch of beginning chain 3. A ring of total of 24 triples. Rnd 2: Chain 6, skip next triple and *single (single crochet) in top of next triple, chain 6,* repeat all the way around ending with a slp.st. in the first stitch of beginning chain 6 (a total of 12 chain-6 loops). Slp.st. in next 2 st’s. of beginning chain 6, single in the chain-6 loop. Rnd 3: Chain 6, *single in next chain-6 loop of previous rnd., chain 6,* repeat all the way around ending with a slp.st. in the first stitch of beginning chain 6 (a total of 12 chain-6 loops). Slp. st. in next 2 st’s. of beginning chain 6, single in the chain-6 loop. Rnd 4: Chain 8, *single in next chain-6 loop of previous rnd., chain 8,* repeat all the way around ending with a slp.st. in the first stitch of beginning chain 8 (a total of 12 chain-8 loops). Slp.st. in next 2 st’s. of beginning chain 8, single in the 4th stitch of the beginning chain 8. Rnd 5: *Chain 6, single in the next stitch of the beg chain-8 loop. 13 Triple in the next chain-8 loop, single in the 4th stitch of the next chain-8 loop. * Repeat all the way around ending with a slp.st. in the first stitch of the beginning chain-6 loop. Slp.st. in the next stitch of the beginning chain-6 loop, single in the beginning chain-6 loop. Rnd 6: *Chain 6 (counts as 1st triple & chain 3), triple in beginning chain-6 loop of previous rnd., chain 3, triple in same chain-6 loop, chain 3, triple in same chain-6 loop, chain 3, triple in same chain-6 loop. Total of 5 triples & 4 chain 3 spaces. Chain 4, single in top of 5th triple of previous rnd. triple grouping, chain 4, skip next 2 triples and single in next triple, chain 4, single in the next chain-6 loop, chain 3*. Continue around ending with a slp.st. in the 4th stitch of beginning chain 6. Slp.st. in the next stitch and single in the chain-6 loop. Rnd 7: *Chain 3, single in the next chain 3 space, chain 7, single in the next chain 3 space, chain 3, single in the next chain 3 space. Chain 5, skip the next chain 4 space, 3 triples in the next chain 4 space, chain 5, skip the next chain 4 space, single in the next chain 3 space. * Continue on around ending with a slp.st. in the first stitch of the beginning chain 3. Cut and fasten off the thread and finish by sewing the tail in. *Chain 3, single in the next chain 3 space, (@ normal chain 7) chain 3, single in the chain-7 space of adjoining motif(s), chain 3, single in the next chain 3 space, chain 3, single in the next chain 3 space. (@ normal chain 5) chain 2, single in the chain-5 space of adjoining motif, chain 2, skip the next chain 4 space. 3 triples in the next chain 4 space. Chain 3, single in the next chain 3 space, (@ normal chain 7) chain 3, single in the chain-7 space of adjoining motif(s), chain 3, single in the next chain 3 space, chain 3, single in the next chain 3 space. Continue on around using the join counts *-* as required for attaching to adjacent motifs. If there are not adjoining motifs to connect to use the stitch counts for the regular Rnd 7 chains. End with a slp.st. in the first stitch of the beginning chain 3. Cut and fasten off the thread and finish by sewing the tail in. Rnd 1: Start with a single in one of the outer chain-7 loops along the straight side. Down the side: *Chain 3, single in the same chain-7 loop, chain 8, single in chain 5 space, chain 8 (skip over the 3 triples of the previous round) single in next chain 5 space, chain 4. Triple in the joined chain-7 loops (between 2 joined motifs) chain 3, triple in the same joined chain-7 loops. Chain 4, single in next chain 5 space, chain 8, (skip over the 3 triples of the previous round) single in next chain 5 space, chain 8, single in next chain-7 loop. * Repeat down the straight side to the first open chain-7 loop of the corner motif. Around the corner: Chain 3, single in same chain-7 loop, chain 8, single in the next chain 5 space, chain 8 (skip over the 3 triples of the previous round) single in next chain 5 space, chain 8. Single in the next chain-7 loop, chain 3, single in the same chain-7 loop, chain 8. Single in the next chain 5 space, chain 8, (skip over the 3 triples of the previous round) single in next chain 5 space, chain 8, single in the last open chain-7 loop of the corner motif. Across the scalloped end: *Chain 3, single in the same chain-7 loop, chain 8. Single in the next chain 5 space, chain 8,(skip over the 3 triples of the previous round) single in next chain 5 space. Chain 4, triple in the joined chain-7 loops (between 2 joined motifs) chain 3, triple in the same joined chain-7 loops. Chain 4, single in next chain 5 space, chain 8, (skip over the 3 triples of the previous round) single in next chain 5 space. Chain 4, triple in the joined chain-7 loops (between 2 joined motifs) chain 3, triple in the same joined chain-7 loops. Chain 4, single in next chain 5 space, chain 8, (skip over the 3 triples of the previous round) single in next chain 5 space. Chain 8, single in the next chain-7 loop, chain 3, single in same chain-7 loop. Chain 8, single in the next chain 5 space, chain 8 (skip over the 3 triples of the previous round) single in next chain 5 space, chain 8. Single in the next chain-7 loop. * Repeat across the scalloped end to the first open chain-7 loop of the next corner motif. Continue around the corner motif as before and around the cloth as directed. When you get all the way around to where your first started, slp.st. in the first stitch of the beginning chain 3, single in the beginning chain-3 loop. Down the side: *Chain 4, single in the same chain-3 loop, chain 6, single in the same chain-3 loop, chain 4, single in the same chain-3 loop. Chain 6, single in the next chain 8 space, 13 triple in the next chain 8 space, single in the next chain 4 space. Chain 3, single in the next chain 3 space, chain 4, single in the same chain 3 space, chain 3, single in the next chain 4 space. 13 triple in the next chain 8 space, single in the next chain 8 space, chain 6, single in the next chain-3 loop. * Repeat down the straight side to the first open chain-3 loop of the corner motif. Around the corner: Chain 4, single in same chain-3 loop, chain 6, single in the same chain-3 loop, chain 4, single in the same chain-3 loop. Chain 6, single in the next chain 8 space, 13 triple in the next chain 8 space, single in the next chain 8 space. Chain 6, single in the next chain-3 loop, chain 4, single in same chain-3 loop, chain 6, single in the same chain-3 loop, chain 4, single in the same chain-3 loop. Chain 6, single in the next chain 8 space, 13 triple in the next chain 8 space, single in the next chain 8 space. Chain 6, single in the last open chain-3 loop of the corner motif. Across the scalloped end: *Chain 4, single in the same chain-3 loop, chain 6, single in the same chain-3 loop, chain 4, single in the same chain-3 loop. Chain 6, single in the next chain 8 space, 13 triple in the next chain 8 space, single in the next chain 4 space. Chain 3, single in the next chain 3 space, chain 4, single in the same chain 3 space, chain 3, single in the next chain 4 space. 13 triple in the next chain 8 space, single in the next chain 4 space. Chain 3, single in the next chain 3 space, chain 4, single in the same chain 3 space, chain 3, single in the next chain 4 space. 13 triple in the next chain 8 space, single in the next chain 8 space, chain 6, single in the next chain-3 loop. Chain 4, single in same chain-3 loop, chain 6, single in the same chain-3 loop, chain 4, single in the same chain-3 loop. Chain 6, single in the next chain 8 space, 13 triple in the next chain 8 space, single in the next chain 8 space. Chain 6, single in the next chain-3 loop. Repeat across the scalloped end to the first open chain-3 loop of the next corner motif. Continue around the corner motif as before and around the cloth as directed. When you get all the way around to where your first started, slp.st. in the beginning chain-3 loop. Cut and fasten off the thread and finish by sewing the tail in. So far in my work as a lacemaker for the temples, I’ve come across more than 35 other lacemakers, either in person, or through this blog. We are quite a group! There are young lacemakers, older lacemakers, most live inside the United States, and some live outside the US. Many are first-time lacemakers, bravely moving from yarn to thread for the first time. There are many women lacemakers, but also men! The other day, I was speaking with a woman who had worked a long time at the temple. 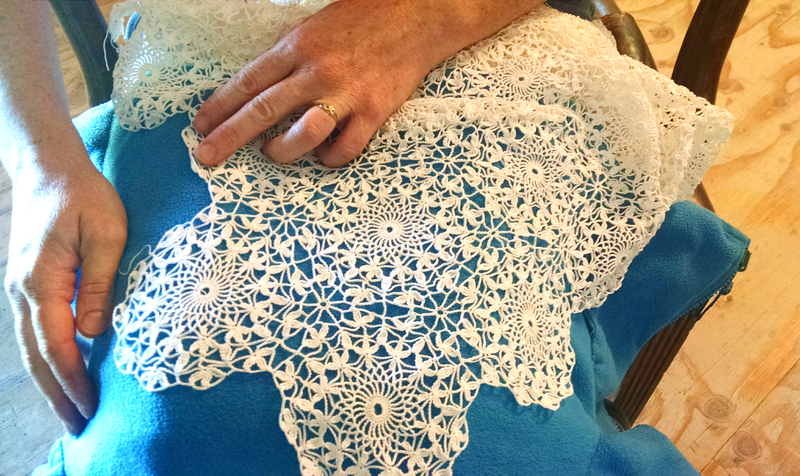 We got to talking about altar lace and what was required to make it, and I mentioned that the lacemaker before me had talked about a dear brother who was a long time lacemaker for our temple. He made altar cloths well into his 90s before he passed away. She perked right up and said she had known him! and remembered the laces he made. She said he’d learned from his mother when he was young, and had never forgotten. That would have been in the early 1910’s. There are a few of his laces still in service. Recently I received an email from a gentleman who tatted, and wanted to find a pattern to make lace for his local temple. I sent him a few resources and he eventually wrote back with a picture of his work. His lace was beautiful! You guys are wonderful. I’m so pleased to be a part of such a great community of lacemakers for the Lord. It really is a beautiful thing.